(2012.201.B0095.0680, Oklahoma Publishing Company Photography Collection, OHS). Attorney and federal judge Luther Lee Bohanon, son of William and Artelia Hickman Bohanon, was born in Fort Smith, Arkansas, on August 9, 1902. In his legal career Bohanon witnessed much of the best and worst of Oklahoma's politics and law. An active partisan in Oklahoma politics, he was a member of the Democratic Party's National Convention platform committee in 1940. Nominated to the federal judiciary by Sen. Robert S. Kerr and appointed by Pres. John F. Kennedy in 1961, he followed in the legal and judicial footsteps of his close friend and law partner, Alfred P. Murrah. As a student of Dean Julien C. Monnet of the University of Oklahoma School of Law, Bohanon graduated from the university in 1927. He worked as an assistant county attorney in Seminole, Oklahoma, from 1927 to 1928 and soon formed a partnership with Murrah. In 1933 he married Marie Swatek, and they had four children. Their surviving son, Richard L. Bohanon, became a U.S. bankruptcy judge in Oklahoma City. During World War II Luther Bohanon served with the Judge Advocate General's Corps of the U.S. Army Air Corps. 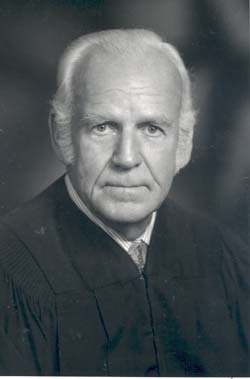 U.S. District Judge Bohanon, who served the Northern, Eastern, and Western Districts of Oklahoma and retired from active status on August 2, 1974, is probably best remembered for his handling of the controversial school desegregation case, Dowell v. Oklahoma City Public Schools (1961). In this important civil rights case, Bohanon found that the Oklahoma City Public School District was operating a dual school system in violation of the Equal Protection clause of the Fourteenth Amendment to the U.S. Constitution. In 1972 Bohanon ordered the school district to develop a plan for cross-district busing of students. The plan remained in place until 1991. Another important Bohanon decision involved Oklahoma prison reform. In March 1974, almost eight months after the McAlester Prison Riot, Bohanon found in favor of McAlester prisoner Bobby Battle in Battle v. Anderson and handed down a sixty-page brief listing forty-three orders to improve prison conditions. Bohanon, a member of the United Methodist Church, belonged to the Kiwanis Club, the Siloam Masonic Lodge of Oklahoma City, and the Shrine. Recognized for community and citizenship activities, he is the recipient of honors from the Oklahoma Legislature, the Oklahoma County Bar Association, and the National Conference of Christians and Jews (Humanitarian Award in 1991). He was honored with the establishment of the Luther L. Bohanon American Inn of Court in 1991. As a deeply religious man with strong convictions, Bohanon wrote the following comment to his entry in Who's Who in America, "A lawyer must possess and demonstrate integrity and fidelity. . . . Do right and fear no man." He died on July 18, 2003, in Oklahoma City and was buried at Fairlawn Cemetery. "Luther Bohanon," Vertical File, Oklahoma Room, Oklahoma Department of Libraries, Oklahoma City. "Luther Bohanon," Vertical File, Research Division, Oklahoma Historical Society, Oklahoma City. Daily Oklahoman (Oklahoma City), 18 April 1999 and 31 October 2001. Kenny A. Franks and Paul F. Lambert, The Legacy of Dean Julien C. Monnet: Judge Luther Bohanon and the Desegregation of Oklahoma City's Public Schools (Muskogee, Okla.: Western Heritage Books, 1983). Jerry E. Stephens, "Bohanon, Luther Lee," The Encyclopedia of Oklahoma History and Culture, https://www.okhistory.org/publications/enc/entry.php?entry=BO004.